The Trump International Hotel in Washington, D.C., made $1.97 million in profit in the first four months of the year, dramatically outpacing the expectations of the Trump Organization. In fact, according to new financial documents first reported by The Washington Post, the Trump family projected a $2.1 million loss for the same period of time when it opened last fall. Instead, from January to April, the hotel's profits were $4 million higher, a 192-percent difference from its original projections. Located just blocks away from the White House on Pennsylvania Avenue, the Old Post Office Pavilion-turned-hotel charges more per room than most other stays in the district, despite the 263-room hotel's low occupancy rate of around 42 percent. 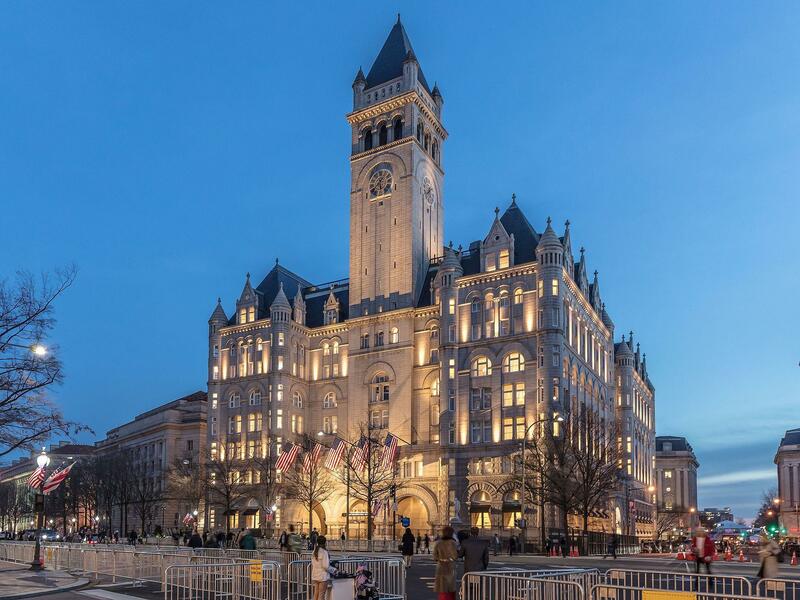 According to General Services Administration (GSA) documents cited by the Post, guests are paying an average of $652.98 a night, 57 percent more than the Trump Organization estimated. That price puts it above other luxury hotel properties like the Hay-Adams, Ritz-Carlton, Four Seasons and Willard Hotels. On Friday, a Google search showed per night prices of $483 for the Four Seasons, $365 for the Ritz-Carlton and $329 for the Hay Adams. The Trump Organization rents it from the General Services Administration for $250,000 each month. Data obtained by the Post about the profits did not show how much of the money arrived through foreign governments. The hotel pledged to donate profits from foreign governments to the U.S. Treasury to remedy complaints that Mr. Trump is violating the emoluments clause, a constitutional provision barring elected officials from receiving money from foreign governments. The Justice Department contended in a June filing that the emoluments clause does not apply to fair-market transactions such as hotel bills. One aspect of the hotel that has seen considerable growth since the beginning of the year is food and beverage sales, over $8 million since January. This also beat the Trump Organization's expectations, the Post reported -- by 37 percent. The inside of the hotel, featuring a ritzy-atrium-topped lobby open to the public, has transformed itself into a social hangout for Trump insiders, MAGA supporters and curious tourists. The president's oldest daughter, Ivanka Trump, has business ventures connected to the hotel, such as her own line at the hotel's gift shop and spa. However, these ventures have not been as fruitful financially. According to her financial disclosures, she has made $2.4 million from her stake in the hotel. She stepped down from the Trump Organization before taking an advising role with her father's administration but maintains an ownership stake in the hotel. The Trump International's sprawling ballroom and other meeting spaces have facilitated Hollywood-sized parties and political gatherings such as a fundraising event featuring Mr. Trump in June. The event was closed to the press, but according to the Post, an estimated $10 million was raised for the GOP. Other notable patrons of the hotel include members of the ruling family of United Arab Emirates, business leaders from Turkish Airlines and even the Kuwaiti government. Their stays and events raise questions about how the hotel is documenting the foreign cash and planning to donate relevant foreign cash to the U.S treasury, as it has promised. Before Mr. Trump was inaugurated, he attempted to distance himself from the hotel that he helped to open, passing management to his two sons. Ethics experts pointed out that Mr. Trump still profits by retaining an ownership interest. Since then, several lawsuits have surfaced by ethics watchdog groups, federal legislators and businesses, claiming that the hotel's ownership and operations at they currently stand violate the law.